We are just back from almost three weeks in Puerto Rico with my parents at the home of my late grandmother, during which I ate loads of classic Puerto Rican Christmas food — perníl, pasteles, morcilla, arroz con gandules — O.M.G. I am fat and happy to have my food fixes fixed! However, I did not do a lot of cooking! I thought my dad and I would take the opportunity to mash it up in the kitchen for the duration, but….my dad, who has a history of embarking on new eating plans that — for better or worse — consume the rest of us, chose THE HOLIDAYS IN PUERTO RICO TO START THE CRAZIEST DIET OF THEM ALL!?! Did he have to purge now!?! Are you kidding me!?! It’s okay that he became a vegan overnight, it’s okay that additionally, sugar and things like bread, rice and pasta are not allowed, but in this version of vegan there is a whole ‘nother complication: you can’t mix food grown under the earth in the same meal as food grown on top of the earth. So you want to saute garlic with your leafy greens? No. You want onions in your chayote salad? No. It’s a big old pain, and while this diet has had great effects for our cousin and other people we know and I hope it resolves whatever my dad hopes it resolves, I just wish he could have put it off until we had had a lot more fun in the kitchen. And I did guilt the churrasco recipe out of him finally! Let’s talk about my single most favorite starchy produce item in the whole wide world: breadfruit, or panapén or pana (as we call it in Puerto Rico). 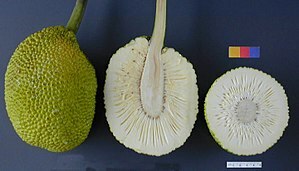 Breadfruit (Artocarpus altilis) is a very tall, lusciously-leafed relative of the mulberry. It originates in Southeast Asia and it prolifically produces canteloupe-size green-peeled starchy fruit that is denser and sweeter than potato. It can be boiled, roasted, fried…anything. Credits to Wikipedia for this image!!!! Remember The Mutiny on the Bounty? Well Captain Bligh was trying to bring breadfruit to the Caribbean from Tahiti (as a way to feed the increasing numbers of slaves) when he was set adrift by his mutinous crew. He eventually succeeded — but legend has it the slaves refused to eat it. 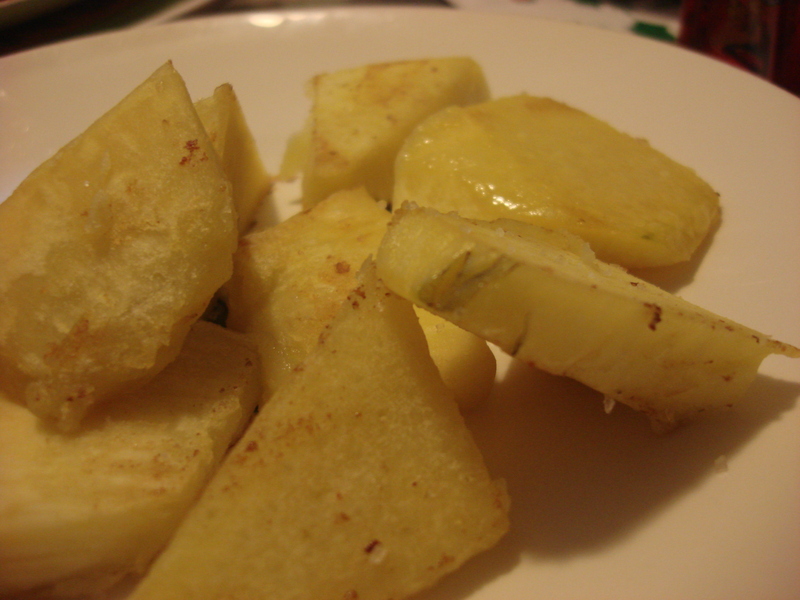 Anyway, breadfruit was not supposed to be in season during this holiday, but my admirers (yes I have some) — the LeBron brothers of the Plaza del Mercado of Mayagüez — managed to obtained some for me and in their desire to please, peeled and sliced it for me before I had a chance to photograph it (thus the borrowed image). Salt an abundant amount of water in a large pot, bring to a boil (either with or without the peeled, sliced breadfruit already in), reduce heat and boil gently for about 15 minutes until tender. Drain and serve with olive oil and salt (and salt cod in vinaigrette, if you’ve got, but that’s a recipe for another day). I mash mine up on my plate with abundant oil, but the pictures didn’t come out very well so a I could not include them. 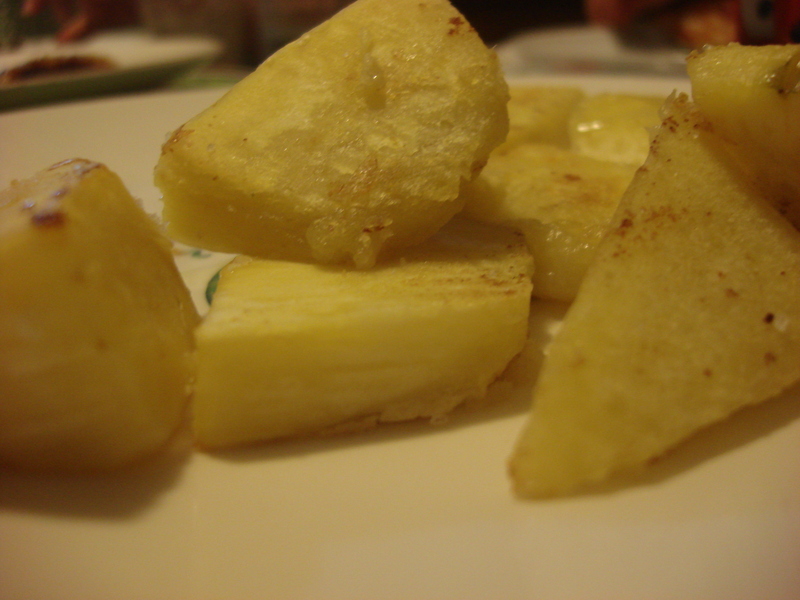 The following day, I took the leftover boiled pana and sliced it into flat squares that I fried in a small amount of vegetable oil. The insides were so creamy…just thinking about it makes my mouth water…And that you can indeed see in the picture. ← La Prensa Loves Hot, Cheap & Easy! Wow, that is a tough time to make a change. I hate being away from the kitchen that long too!